The Zeiss 18mm f/3.5 Distagon T* ZE Lens is a very high quality, manual focus-only, ultra-wide angle lens. If you need very high image quality, don't need autofocus and an f/3.5 aperture is wide enough for you, you will want to finish reading this review. After gaining a comfort level with this lens' performance locally, I took the Zeiss 18 along with me as one of my primary lenses for a photo trip to St. John, USVI. When spending the money and effort to go on a distant photo trip such as this, I only take gear that I know will deliver results worthy of my costs. And the Zeiss 18mm f/3.5 Distagon T* ZE Lens results from this trip left me more than satisfied (see the sample photos). When used on a full frame DSLR (example above is from a Canon EOS 5D Mark II), 18mm has a very wide angle of view. Ultra-wide angles of view are great for emphasizing the foreground subject, for de-emphasizing but retaining the background (making background details appear smaller but remaining sharp) and for creating a sense of presence. The longer I shoot, the more I love shooting ultra-wide angle focal lengths. I find it challenging to locate a composition where everything in such a wide angle of view falls into place - and challenging to find a foreground that adds to the big picture taken in by these lenses. 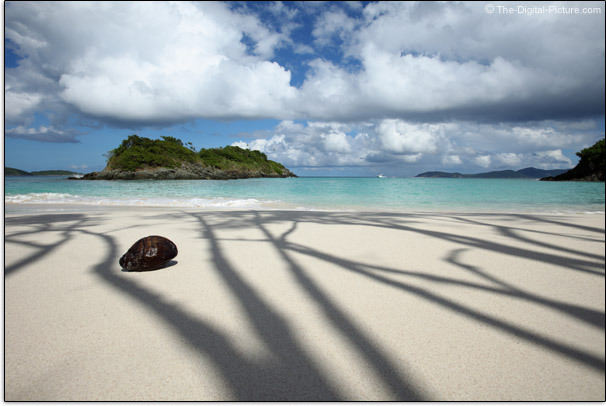 When the right composition is found and the shot is properly executed, dramatic images are the result. Landscape and architecture (indoor and outdoor) photography are two examples of popular uses for ultra wide angle lenses. 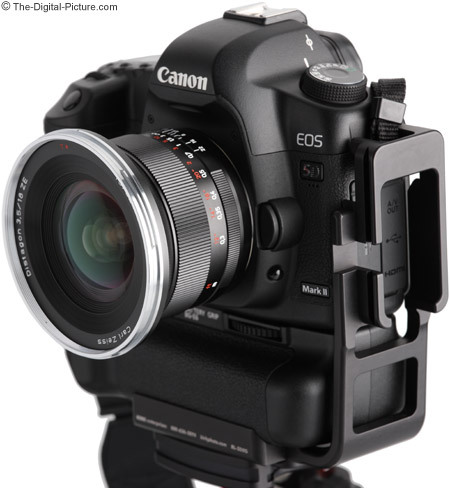 When used on an APS-C/1.6x DSLR body, 18mm frames like a 28.8mm medium-wide angle lens. This is a very useful angle of view - one that I find less challenging to find the right subjects for. As well as for landscape and architectural uses, this 28.8mm focal length can be used for loosely-framed full body and environmental portraits or for group portraits when only a short working distance is available. While an 18mm lens is great for creating dramatic perspectives, this attribute is not often one you want for portrait photography. If you shoot at 18mm with a short subject distance (on any camera format), whatever is closest to the lens is going to appear significantly larger than what is not as close. The subject's nose is probably going to be closest person part - and their ears may be the most distant part. The result is a huge nose and tiny ear(s). Move back and include the subject as part of a much larger environment and this lens will deliver nice results. I mentioned at the beginning of this review that the Zeiss 18mm f/3.5 Distagon T* ZE Lens (and all other Canon, Nikon and Pentax mount Zeiss lenses current at review time) is manual focus only. The subject list I mentioned for this lens is certainly not conclusive, but manual focus works well for these subjects - and needs to work well for your subjects if this is your selected lens. The right focal length is usually my first factor in deciding which lens I'm going to use (along with an adequately wide max aperture), but image quality is usually close behind. The Zeiss 18mm f/3.5 Distagon T* ZE Lens delivers in this regard. It is very sharp wide open and sharp right into full frame corners. Little improvement is noticed by stopping down this lens - and none is needed. 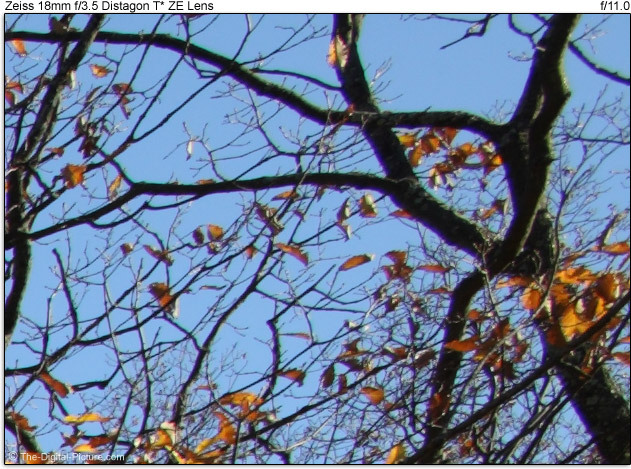 However, the corner sharpness is difficult to ascertain at f/3.5 due to the strong vignetting. Vignetting is a weakness of the Zeiss ZE 18. With about 4.5 stops of shading in full frame corners at f/3.5, vignetting is going to be noticed. About 1.2 stops of shading remains at f/16. On APS-C bodies, expect about 1.5 stops of shading in the corners at f/3.5 and by f/5.6, the shading is essentially gone. CA (Chromatic Aberration) is noticeable in full frame and APS-C corners. You can see this in the bottom two ISO 12233 resolution chart crop samples and in the image quality comparison later in this review. CA is easy to remove with software (note that Zeiss lens CA correction is not supported by Canon's DPP), but flare is not. It is easy to get the sun in the frame with an 18mm lens and the sun (or other bright light sources) in the frame often leads to flaring. Expect a moderate amount of flaring from the Zeiss ZE 18. Also hard to remove in post processing is the Zeiss ZE 18's wave/mustache type barrel distortion that curls outward again at the corners. A straight line (edge of a building, horizon over an ocean) running along the top edge of the frame will appear wavy - like a very wide, short, rounded letter "W". Look for an example that shows some of this effect in the sample pictures. 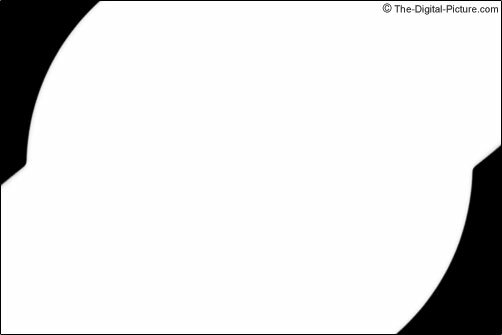 Without the straight line near a frame edge, the distortion is not noticeable. The Zeiss ZE 18's distortion is very similar to what I saw in the Zeiss 21mm f/2.8 ZE Distagon Lens Review. An ultra-wide angle lens with only a moderately wide aperture is not going to be a good choice for throwing the background out of focus, but the Zeiss 18's bokeh (background blur quality) seems nice. The Zeiss 18mm f/3.5 Distagon T* ZE Lens is a manual focus-only lens, but its manual focus ring is extremely nice - as good as it gets. Videographers especially love pulling focus with Zeiss lenses. The metal focus ring is nicely sized, is very smooth, has no play and is very well damped over the 95 degrees of rotation. Focusing is completely internal and the front filter threads do not rotate. Accurate, engraved distance settings are very well marked in both ft and mm and line up to engraved DOF markings. Infinity focus is a hard stop (no focusing past infinity). 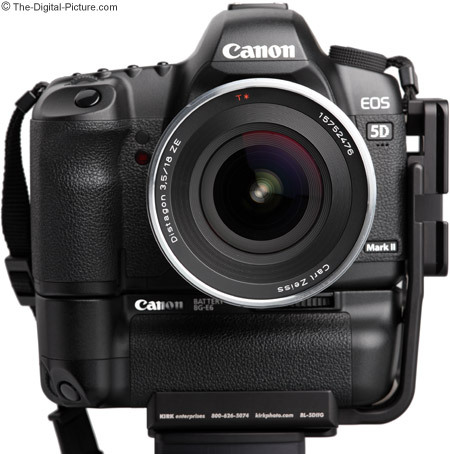 Canon EOS DSLRs will signal when proper ZE 18 focus is achieved via the viewfinder focus indicator light and beep (if enabled). I found these indicators, though not super precise, to be quite effective with this lens. Use 10x Live View for the best manual focusing results. An 18mm lens that only focuses to 11.8" (300mm) is not going to yield much magnification. I doubt many people are going to find this spec to be an issue with their use of this lens. The Zeiss 18mm f/3.5 Distagon T* ZE Lens is built like the rest of the Zeiss ZE, ZF.2 and ZK lenses - impressively well. This is an extremely-precisely and solidly built lens. The Zeiss 18 exterior is entirely metal (no rubber or plastic) and glass. Lacking autofocus and image stabilization, the Zeiss ZE 18 has exactly zero buttons and switches. The focus ring covers much of the lens barrel along with a just-adequately-sized area to grip the lens for mounting/unmounting. The included metal hood has a precise fit and stores very compactly when reversed. Note that proper hood alignment is required during installation - the ZE 18 hood can be installed in 3 positions, but two result in full frame vignetting as illustrated below. A classy-looking center-and-side-pinch lens cap finishes off the Zeiss 18mm f/3.5 Distagon T* ZE Lens appearance. I expect the Zeiss 18's build quality to impress you - it feels like it would perform flawlessly forever. Though very well built, the Zeiss ZE 18 is not large or heavy - it feels compact in your hand. As solidly-built as this metal lens is, the Zeiss 18mm f/3.5 Distagon T* ZE Lens is lighter than all other lenses in this comparison group except the much lower quality Canon EF 20mm f/2.8 USM Lens. 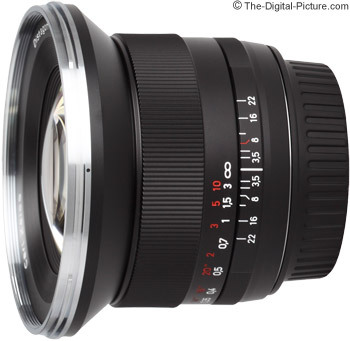 82mm is the largest common filter size found on Canon-mount lenses. Larger filters typically cost more than smaller filters. But, accepting normal screw-in filters at all is a benefit over some other lenses in this group. Note that standard-thickness UV filters increase vignetting with this lens. Here is a visual size comparison of some similar lenses. 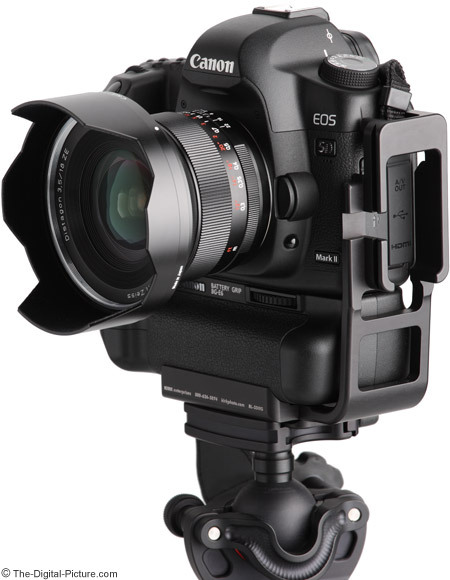 Canon TS-E 17mm f/4 L Tilt-Shift Lens. Even with its lens hood installed, the Zeiss 18 is the most compact lens in this group. The Zeiss 18mm f/3.5 Distagon T* ZE Lens definitely compares well from an image quality perspective. The ISO 12233 resolution chart, vignetting and flare comparison tools on the site allow various lenses to be compared to each other. In addition, here are the results of an outdoor comparison shoot. Click on the image below to see an outdoor image quality comparison between several full-frame-compatible ultra-wide angle lenses. The Canon TS-E 17mm f/4 L Tilt-Shift Lens wins this comparison. It has the advantage of the larger image circle (needed to allow the movements to work properly) - it is sharper and shows less vignetting, less distortion, less flare and less CA. The Zeiss 18mm f/3.5 Distagon T* ZE Lens is smaller, lighter and far less expensive than the TS-E 17 - it also accepts screw-in front filters. The Canon EF 17-40mm f/4.0 L USM Lens of course has the focal length range and autofocus advantage, but the soft extreme corners and additional barrel distortion at 17/18mm are downsides. The 17-40 shows less flare than the Zeiss 18 and costs considerably less. The Zeiss 21mm f/2.8 Distagon T* ZE Lens costs somewhat more than the not-inexpensive Zeiss 18, is a bit larger and has a somewhat narrower FOV (Field of View). The Zeiss 21 has a wider aperture, has less vignetting, is slightly sharper and has less CA. The Zeiss 21 is my personal preference between the two, but both of these are very good lenses. 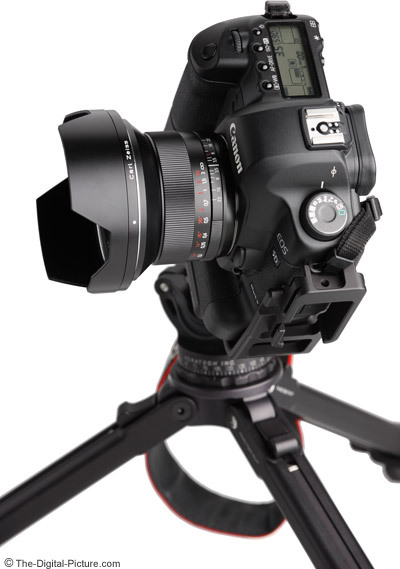 The ZE (Canon EOS) Mount of the Zeiss 18mm Distagon T* Lens was used for this review. This lens is also available in Nikon F Mount (Zeiss 18mm f/3.5 Distagon T* ZF.2 Series Lens) and Pentax K-Mount SLR Cameras (Zeiss 18mm f/3.5 Distagon T* ZK Series Lens). 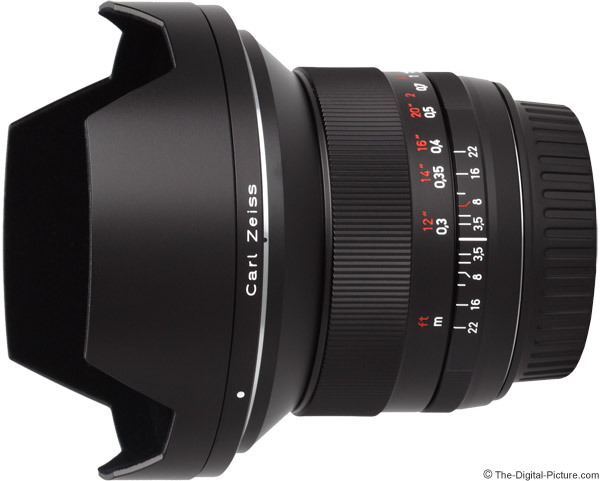 The reviewed lens was purchased directly from Zeiss through a special purchase program. The Zeiss 18mm f/3.5 Distagon T* ZE Lens is an impressively well-built ultra-wide angle lens that performs very well optically. It looks great and is a dream to use. I trusted it for an important-to-me photo trip and have no regrets from relying on it. If you want sharp results from your wide angle photography (and do not need autofocus), the Zeiss 18 is a very good choice. * Buy Now - $600.00 rebate available from ?